The PDW-680 XDCAM HD422 camcorder is a mid-range Professional Disc camcorder with many of the same features as the more advanced PDW-700. The PDW-680 has three 2/3-inch type Exmor CMOS sensors for recording 1080/50i or 1080/60i HD images or MPEG IMX and DVCAM SD, as standard. Progressive mode is available only for playback. The PDW-680 is designed to enable a smooth migration from tape camcorder use to PC-based operation to improve workflow efficiency with MXF/MPEG interoperability and metadata functions. The PMW-680 is equipped with three 2/3-inch type Exmor™ CMOS sensors, each with an effective pixel count of 1920 (H) x 1080 (V). These deliver superior picture performance with full HD resolution. This 2/3-inch-type image sensor allows the camcorder to provide an excellent sensitivity of F12 in 60Hz mode and F13 in 50Hz, a remarkable signal-to-noise ratio of 59 dB, and a high horizontal resolution of 1000 TV lines at 60i. The Exmor CMOS sensor is a unique design that deploys an A/D converter to each column of pixels, resulting in a much lower clock speed than conventional CMOS sensors. This makes it possible to greatly reduce power consumption of the camcorder. So while the PDW-680 is the same size and weight as the PDW-700, it has a power consumption of approximately 5W less than the PDW-700, enabling longer battery life. The PDW-680 has flexible, multi-format recording capabilities. Users can select an HD recording format (MPEG HD422, MPEG HD) or SD recording format (MPEG IMX 50/40/30 and DVCAM) in 59.94i and 50i. Progressive mode is available only for playback. Having a built-in up/down convertor between HD and SD, the PDW-680 can be integrated into an existing SD production system or can be used for HD operation. The PDW-680 features a Digital Extender function to enable images to be digitally zoomed four times in size. Unlike lens extenders, the Digital Extender performs this function without loss of image sensitivity. Combining Digital Extender with Focus Magnification, the image will expand up to eight times, allowing for more precise focusing. The PDW-680 allows for both the optional CBK-SC02 analogue composite input board and CBK-HD01 HD/SD SDI input board to be installed at the same time. The option boards enables the camcorder to record video and audio output from an external deck or camcorder. The PDW-680 is equipped with the same high quality stereo microphone as the PMW-350 camcorder. It is also compatible with a wide variety of microphones via the VF interface, allowing it to work with shotgun-type microphones such as the ECM-680S, ECM-678 and ECM674*. There is also a slot to accommodate the DWR-S01D/S02D digital wireless microphone receiver, which provides stable and secure two-channel audio. The WRR-855 series analogue microphone receiver can also be used. *For the ECM-678 and ECM-674, the 3pin -5pin conversion cable EC-0.5X3F5M is not supplied. The PDW-680 incorporates a high-performance 14-bit A/D converter that enables images captured by the high-performance CCDs to be processed with maximum precision. In particular, this high-resolution A/D conversion allows the gradation in mid-to-dark-tone areas of the picture to be faithfully reproduced. Thanks to the 14-bit A/D converter, pre-knee signal compression in highlighted areas can be eliminated, and the camera can clearly reproduce a high-luminance subject at a 600% dynamic range. The DSP (Digital Signal Processing) LSI is the heart of the image-processing device for the PDW-680 camcorder. In conjunction with the 14-bit A/D converter, it reproduces images captured by the CCD at maximum quality. In addition, white balance, white shading, and flare are digitally corrected, allowing for stable image correction. In addition, the PDW-680 provides a NS (Noise Suppression) mode to reduce high-frequency noise elements in a video signal using Sony's advanced digital processing technology. The PDW-680 records uncompressed four-channel, 24-bit audio. It is also equipped with a range of audio interfaces. The PDW-680 is designed to be very compact and ergonomically well balanced, providing a high level of mobility and comfort in various shooting situations. It weighs only 6.0 kg (13 lb 4 oz) including the HDVF-20A viewfinder, the ECM-680S microphone, the PFD50DLA disc and the BP-GL95 battery pack. To minimize errors caused by shock or dust entering the disc drive, the PDW-680 has several unique ways of providing operational resistance to such factors. The disc drive entrance is concealed by two lids, helping to prevent any dust from entering the drive. In addition, four rubber dampers are used to hold the disc drive block in place and to absorb shocks that would otherwise go into the disc drive. Two types of optional viewfinders are available for users: the HDVF-20A and HDVF-200 2.0-inch* monochrome viewfinders and the HDVF-C35W 3.5-inch* colour viewfinder. A large, easy-to-view, colour LCD screen on the PDW-680 camcorder's side panel enables operators to instantly review recorded footage, as well as access the camera's set-up menus and view status indications such as four-channel audio meters, and the remaining time available on the disc and battery. It also enables advanced operations such as Thumbnail Search and Scene Selection. The shutter speed of the PDW-680 is selectable down to a 16-frame period (in 2-, 3-, 4-, 5-, 6-, 7-, 8- and 16-frame periods). During such a long frame period, electrical charges accumulate on the CMOSs, which dramatically increase sensitivity. This helps camera operators to shoot in extremely dark environments. The Slow Shutter function also allows operators to use shutter speeds longer than the frame rate and to intentionally blur images when shooting a moving object, for increased shooting creativity. The PDW-680 offers an Interval Recording function, which intermittently records signals at pre-determined intervals. This is convenient for shooting over long periods of time, and also when creating pictures with special effects of extremely quick motion. The PDW-680 offers a Picture Cache Recording function that is especially useful during ENG applications. Up to 30 seconds of audio and video signals are buffered into the camcorder's memory before the Rec start button is even pressed (when in Standby mode). This means that everything that happened 30 seconds before the Rec start button was pressed will still be recorded onto the disc. This function works even before the disc is inserted in the drive - thereby helping to prevent the loss of any unexpected, yet important events. The caching period can be adjusted by menu setting. This camcorder cache memory also allows users to exchange the discs while recording. By removing a disc from the drive and inserting a new disc within 30 seconds, video, audio, and time code can be recorded seamlessly onto the new disc. A wide choice of gain and its easy-to-use control system is one remarkable feature of the PDW-680 camcorder. By setting the gain to the assignable switches, the user can easily access the desired gain. And the transition to each gain value is extremely smooth thus eliminating undesirable abrupt changes to the overall image. The PDW-680 camcorder comes equipped with optical ND (Neutral Density) filters and electrical CC (Colour Correction) filters. The optical ND filter is controlled via a built-in ND filter wheel -- Clear, 1/4ND, 1/16ND/, and 1/64ND. And with the electrical CC filter, the user can easily obtain the desired colour temperature by setting the mode - 3200K/4300K/5600K/6300K - on a camcorder-assignable switch. The user can select the four values cyclically or choose one preset value. Another usage of the CC filter function is the colour temperature setting which can be instantly set to the required level with an absolute value 3200K, 4300K, 5600K, or 6300K. This is also available via an assignable switch. This is useful when a sudden change happens in the shooting environment and a quick and direct setting is required. 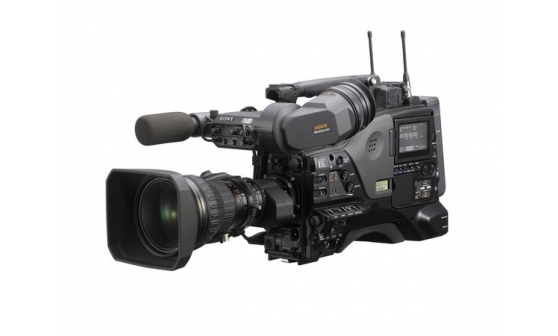 The PDW-680 camcorder has the Trigger REC function that enables synchronized recording with PDW-HD1500 or portable flash memory recorders connected via the HD-SDI 10bits HD422 interface - a convenient feature for backup recording. Bringing outstanding image quality and leading-edge technology to every level of content creation.